She survived both your terrible two's & tumultuous teens - and she still loves you! From changing those dirty diapers through making a skinned knee feel better, all the way to offering her support and unconditional love when life throws you a curve ball, mom is the truest friend in your world. Almost any woman can give birth to new life - only a mother can cultivate that life with love and patience, watching her helpless and weak offspring develop into loving human beings that are as strong and compassionate as she is. As kids, we can’t imagine a world where mom isn’t there to catch us when we fall. As grownups, we all too easily forget what it took her to be able to do this. Even when gifting season returns, the best most moms can hope for is a hug and something she might find useful in her kitchen or garden. Where’s the fun in that? More importantly, where’s the excitement and well of emotions only a great gift for her can cause? 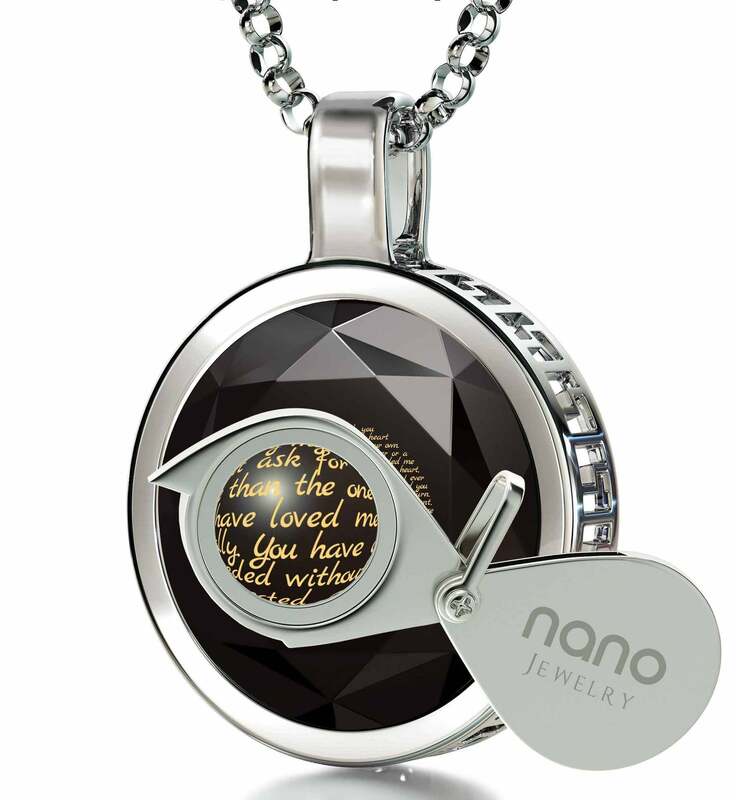 It’s high time to celebrate what a beautiful woman she is with equally beautiful presents for mom exclusive to Nano Jewelry’s artistic collections! There’s absolutely no need to run around aimlessly anymore in search of Christmas presents for mom or things to get your mom for her birthday. We’ve made sure that you have an ample selection of presents to choose from and can do so in the peace and quiet of your own home. Cool mom gifts with a unique vibe to them as well as deeply touching ones filled with true emotion are yours to browse and hers to delight in! The two collections are made up from necklaces that pay homage to mom’s inner beauty and help bring out her outer one as well. 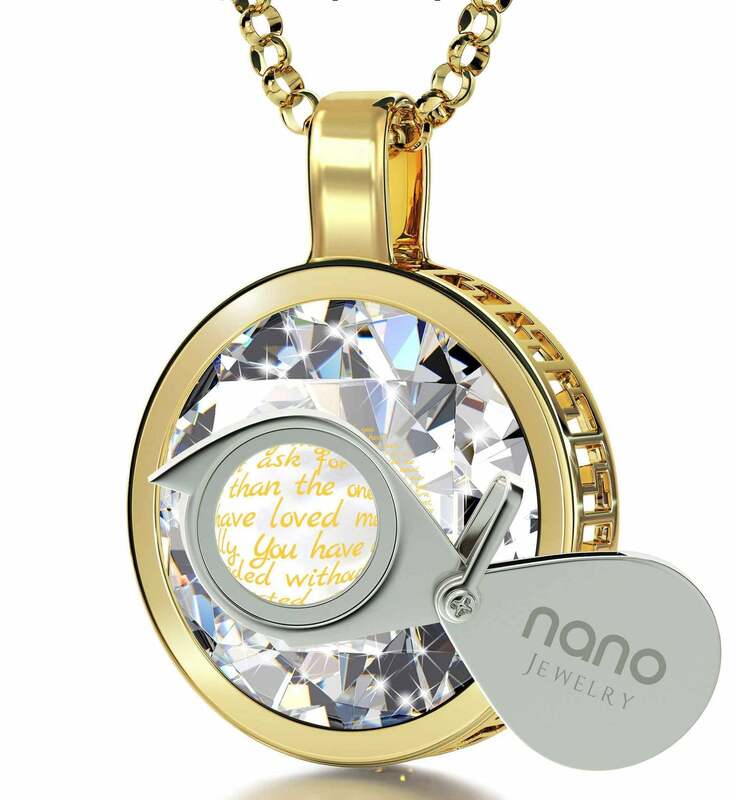 The good gifts for mom found within all have meaningful golden inscriptions which transform the already beautiful necklaces into one-of-a-kind expressions of love for your mother. This is only possible due to the special process with which they’re brought to life in magnificent detail on a scale no one can replicate. It makes each inscription last forever, and makes the necklaces unobtainable from anyone else. 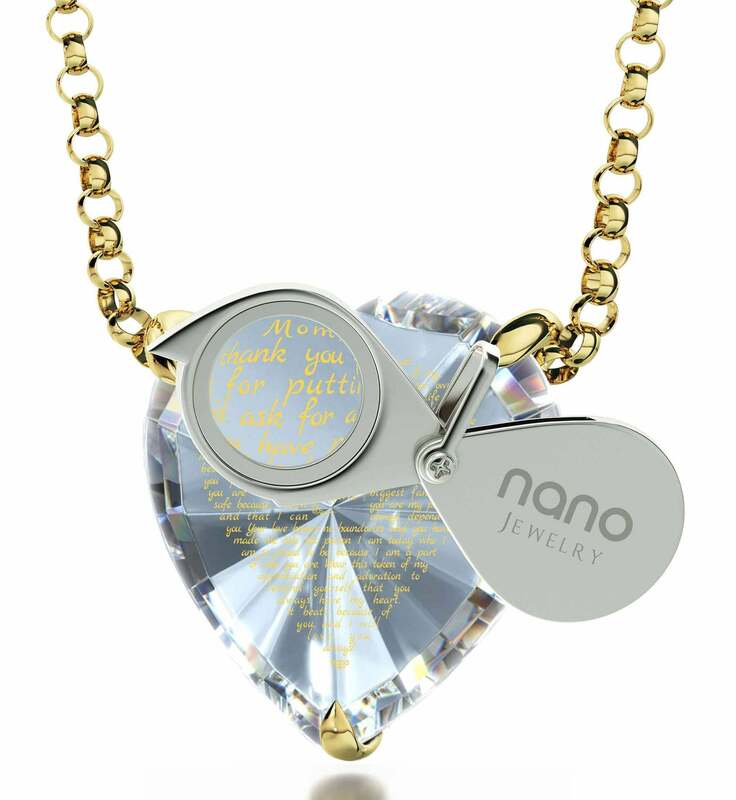 The most heartwarming and emotional collection of mom jewelry is inspired by the need to tell mom everything you’ve ever wanted to say to her with words of appreciation and love. 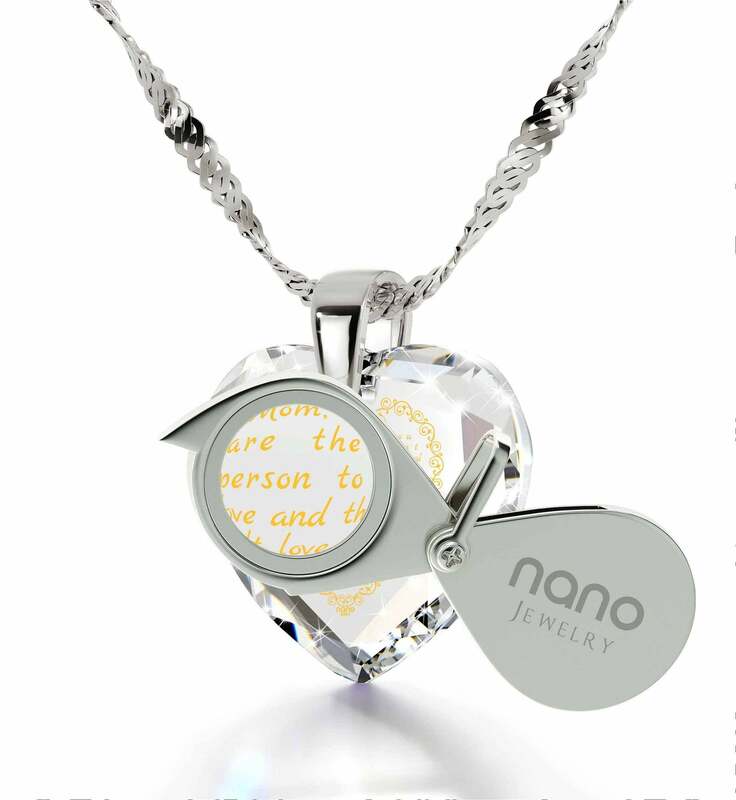 We’ve set a new standard for inscription excellence by adorning every single necklace in the collection with a long and elaborate thank you for all that she’s done and sacrificed in helping to shape you into the individual you are today. Whether you want to knock it out of the park this year by getting her some touching Mothers Day jewelry, or wish to elevate mom’s birthday celebration to another level entirely, a dainty necklace from this collection will excite and bring the both of you to tears, in a good way of course! 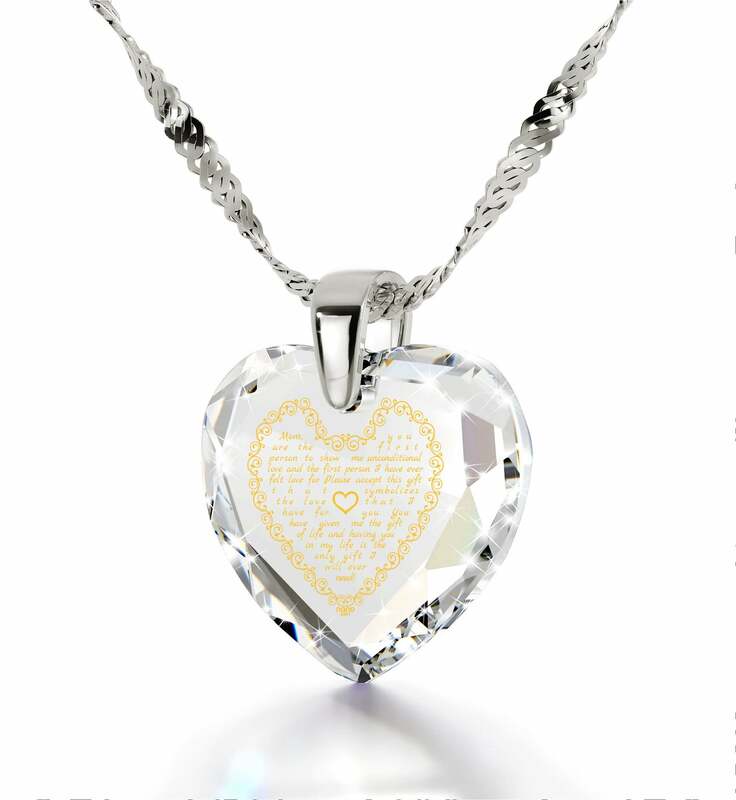 The jewelry you’ll come across while looking it over has inscriptions in two forms. One is a testament to mom's accomplishments and sacrifices in raising you right. 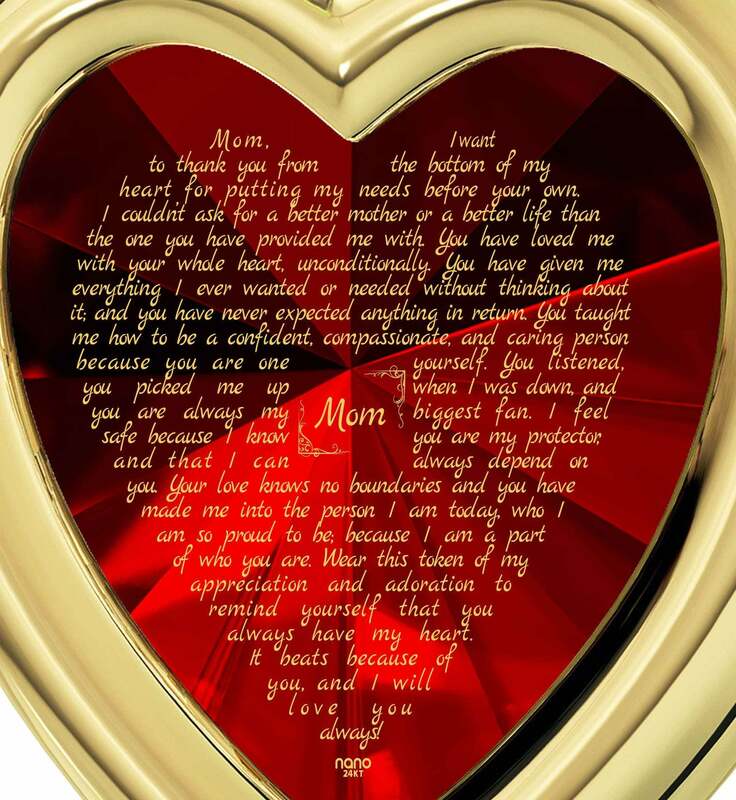 The other is written like a small affectionate letter to mom, making it that much more personal. Can you imagine a more unique Mother’s Day gift than a small round necklace made with luxurious white gold? 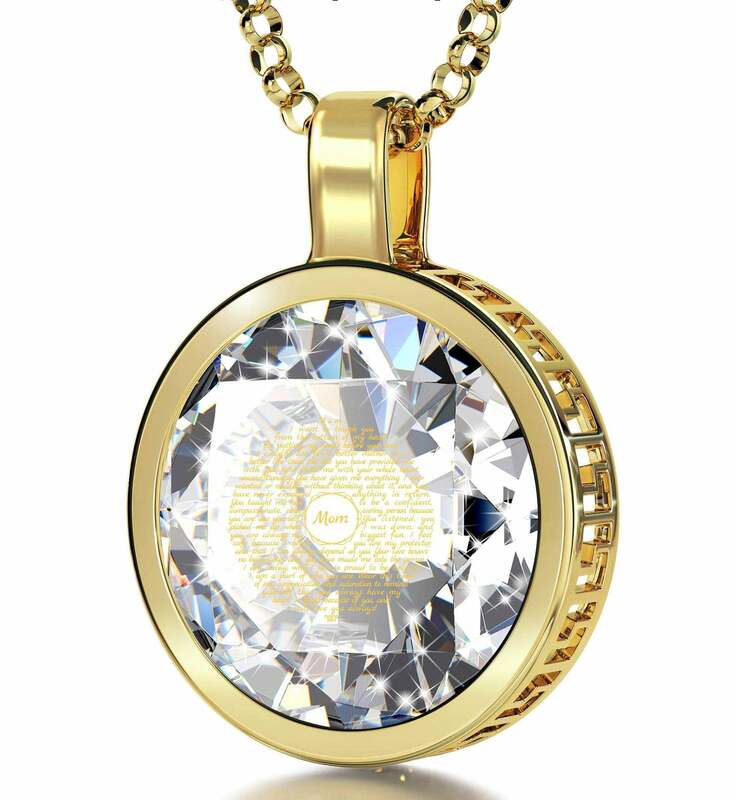 The make of its fine frame and dainty chain are surpassed only by the truthfulness of the message inscribed on the cubic zirconia gem faceted to make sunlight dance before her eyes and make the words of gold even more vivid. Another great gift for mom from this collection, this small necklace in the shape of a heart is sure to find its way straight to hers the second she sees it and gasps in delight! 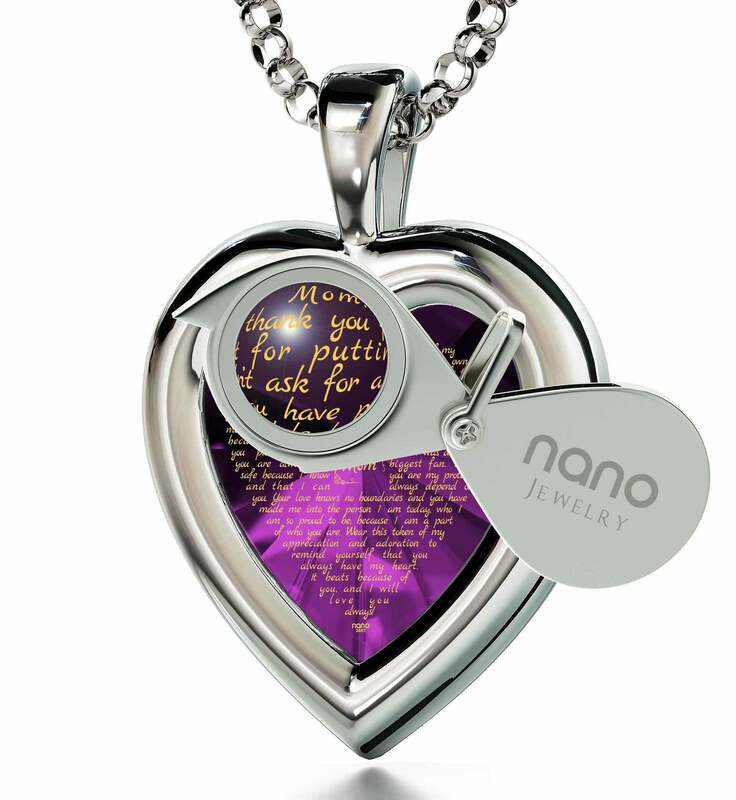 A great mom gift found within you can give your mother as a wonderful surprise is a heart-shaped, unique necklace with the letter in its very center. 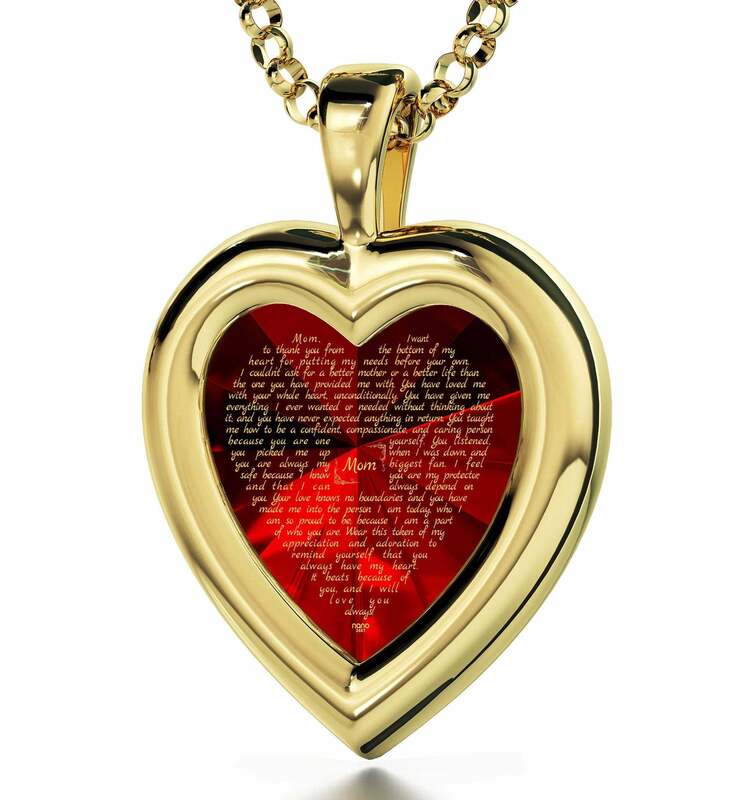 Spelled out in a rich, flowing cursive and bordered by artistic vines which weave themselves together in a cute little heart, it ought to convey much more than the letters of gold spell out. 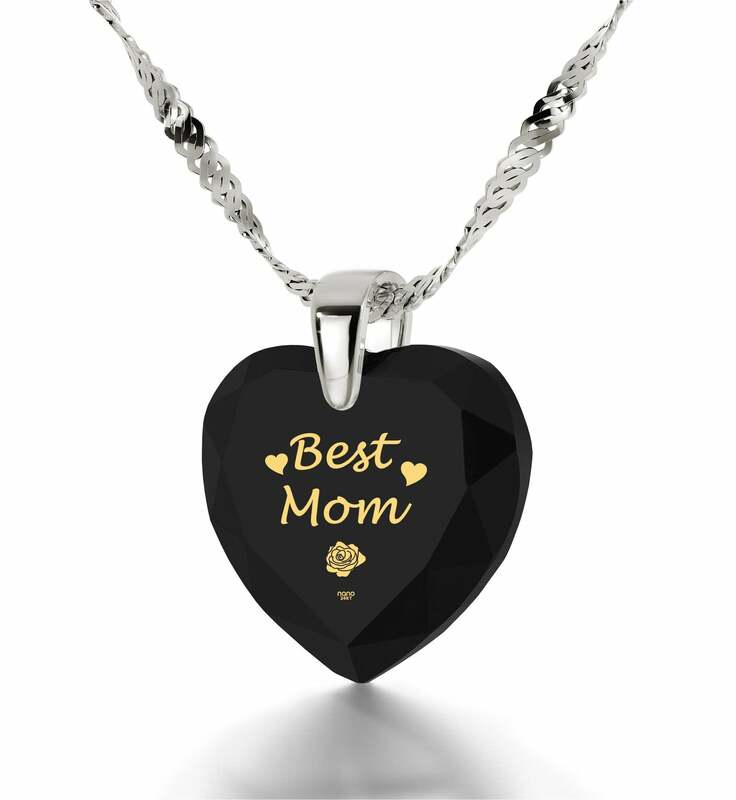 Or, you could select its silver version and put worrying over what to get your mom for her birthday completely to rest. 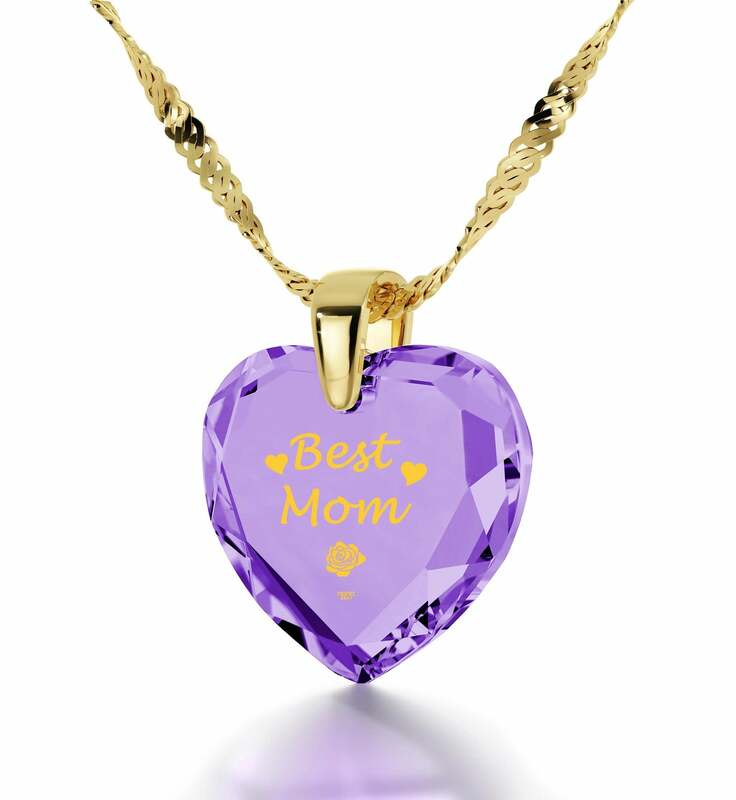 Our last mom-themed collection is made up of only the best mom gifts… literally! Where the other two are eloquent in expressing everything you feel, this collection cuts straight to the chase without mincing too many words. It’s no secret that there’s no better mother around than your own, so “Best mom” are the most fitting words to grace the kind of womens birthday gift she’s wanted for an eternity. 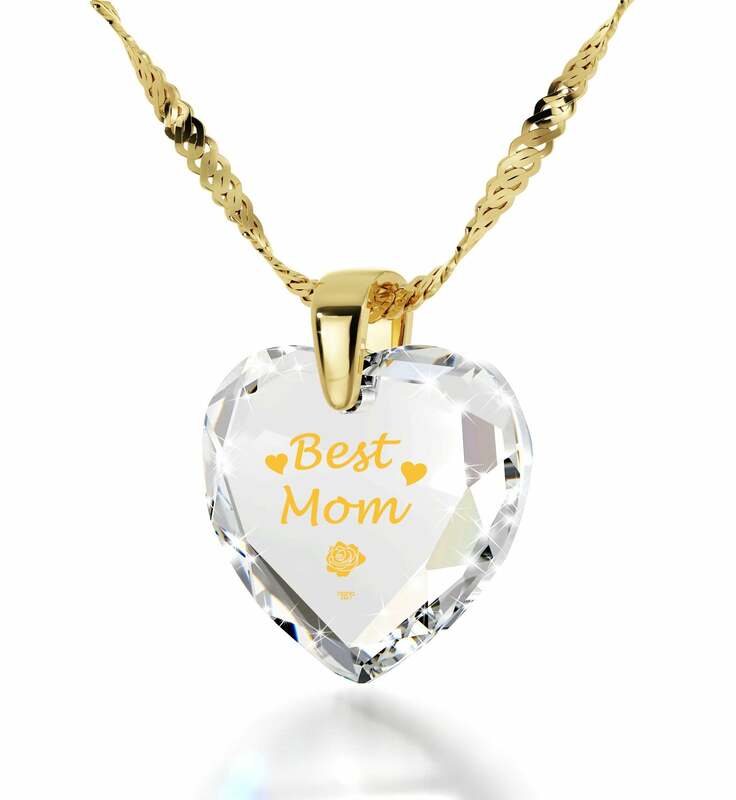 The top gift for mom which stands out here is a dainty silver necklace boldly proclaiming “Best Mom” for anyone she meets to get the point. Underneath there’s a delicate golden rose which adds a touch of elegance to the design and adds to its beauty. This lovely mom gift idea is also sold in French and German, so more moms than ever get to show their new gift off to their envious friends, or at a dinner date with dad. 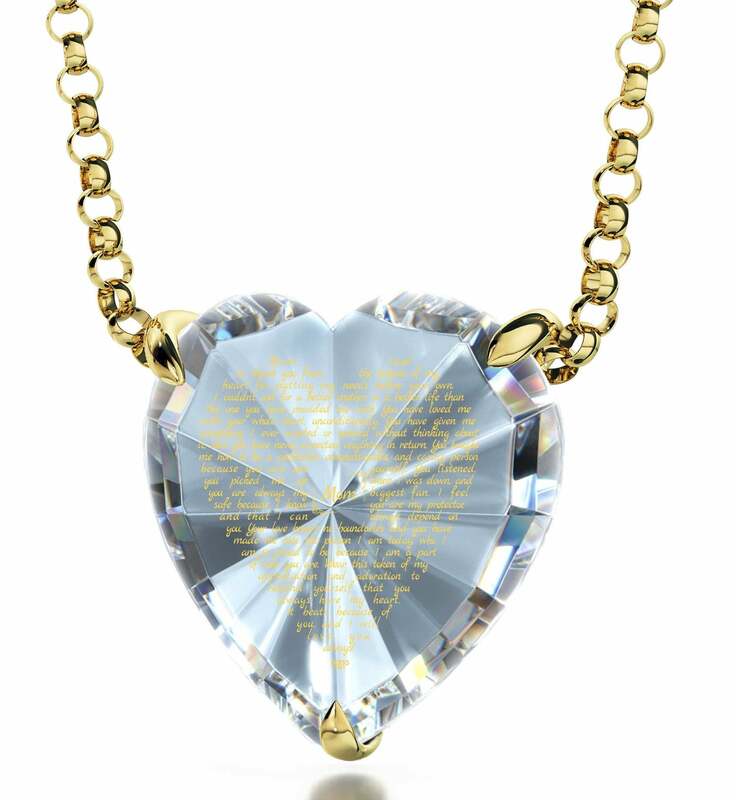 The greatest thing about the necklaces, other than their beautiful inscriptions of course, is that you get to have a say in putting together a combination of gem colors and precious metals which make up their frame / chain. 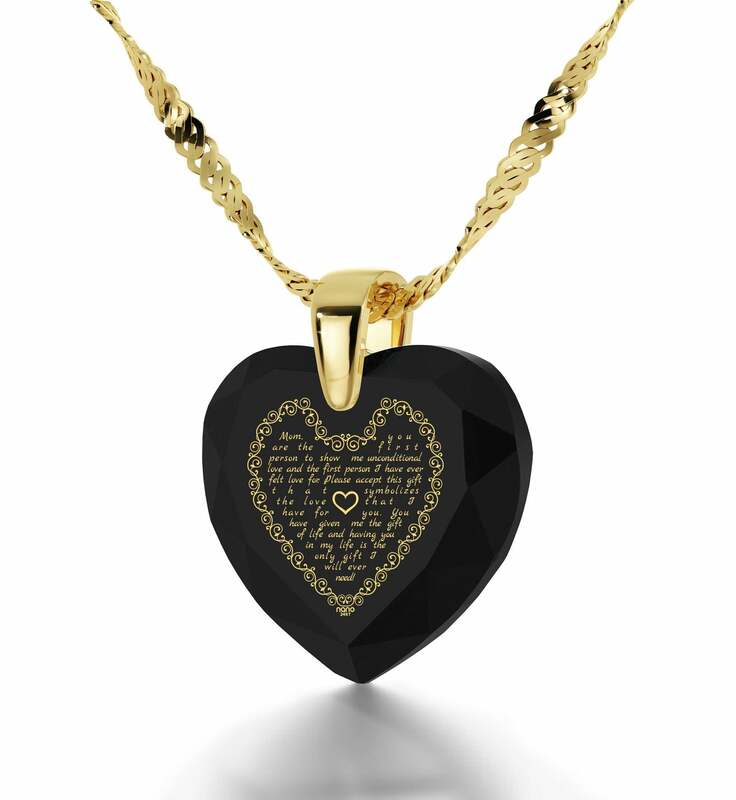 A striking contrast of jet black clad in sterling silver , the warmth of red garnet wrapped in gold or many more options in between refine each necklace even more, even making it a worthy gift for mom who has everything other than an inspired token of your gratitude. 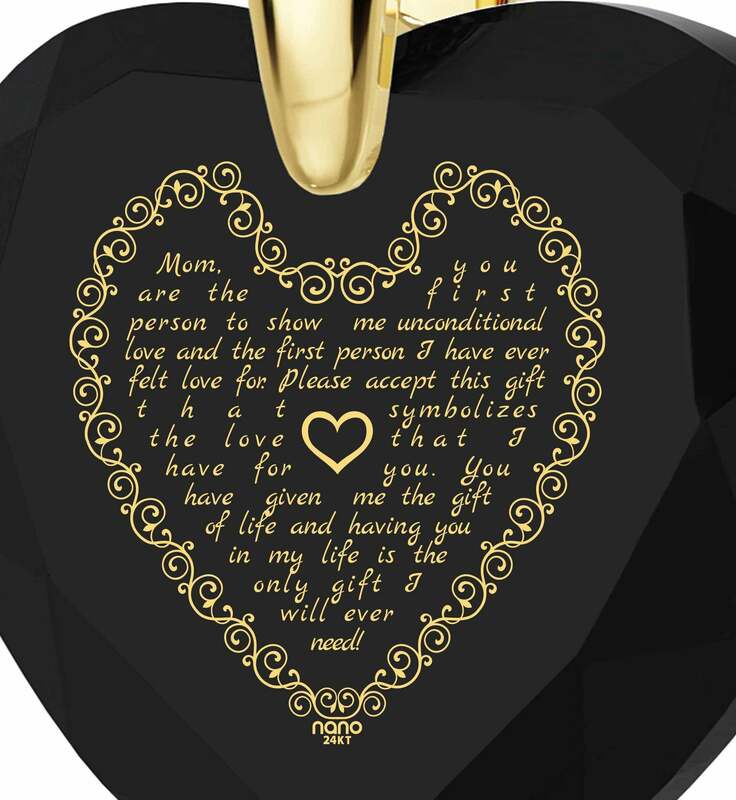 A mother birthday gift that’s just right for her is yours of the taking! Gong through our snappy and secure checkout system is all that stands between your mother and what’s destined to become her most prized gift from you yet. 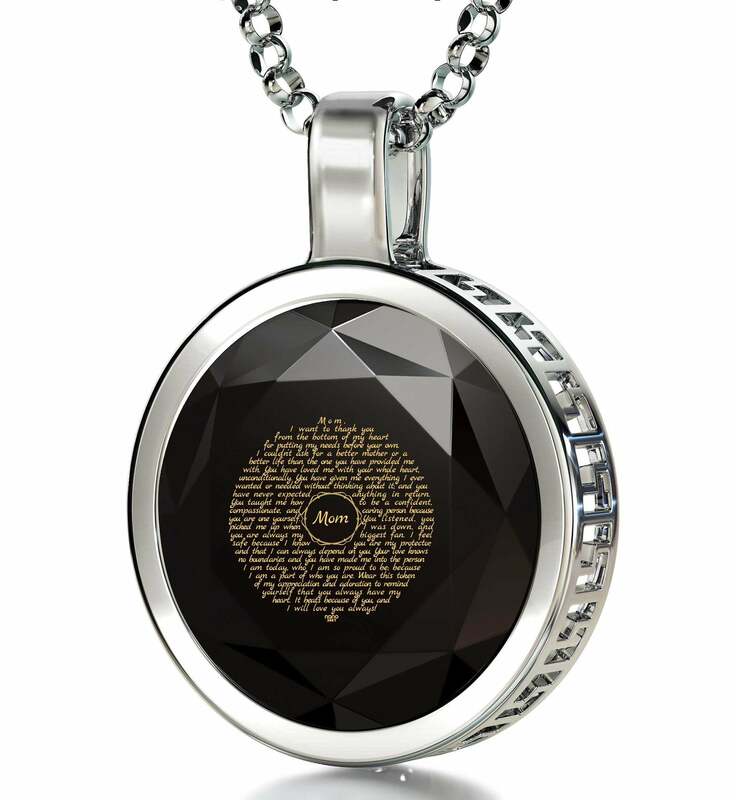 To add to its loveliness, every meaningful necklace ships in the company of a special little magnifying glass for easier viewing of the inscriptions. Pick a special occasion or buy on a whim – whatever the reason behind your thoughtful gift for her, it will create memories both of you will treasure.